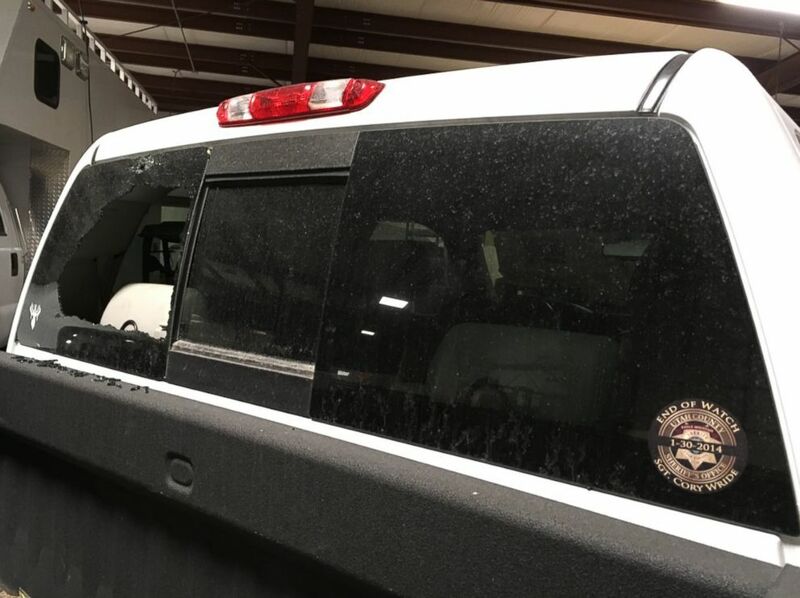 Utah authorities are defending the actions of four sheriff's deputies and a police officer who fired 75 shots at an armed murder suspect fleeing in a stolen pickup truck last month. The suspect, Arturo Ray Gallemore-Jimenez, 37, was shot three times in the Dec. 20, 2017, incident but survived the barrage of gunfire that included 27 shots fired by a SWAT officer armed with an automatic assault weapon, according to the Utah County Sheriff's Office. Authorities said a bystander parked on the side of the freeway was shot in the shoulder by an errant bullet fired by law enforcement, and that another shot shattered the window of a family's pickup truck driving on the interstate, just missing a 4-year-old. The high-stakes confrontation erupted when Gallemore-Jimenez allegedly shot at deputies with a .38 caliber revolver after he was pulled over on Interstate 15, about 60 miles north of Salt Lake City, Sgt. Spencer Cannon told ABC News. (Sgt. Spencer Cannon of the Utah County Sheriff's Office) Shattered rear window of a truck hit by an errant bullet fired by law enforcement. Officials said the stray bullet just missed hitting a 4-year-old child. Cannon said it was vital that officers prevented the suspect from leaving the freeway and driving into highly populated areas. "Had he gotten off the freeway into one of these areas it would have been a nightmare," Cannon said. The incident started about sundown when the sheriff's office received a report that a man fired shots at a truck stop parking lot in Nephi, Utah, Cannon said. He said witnesses told deputies that the suspect shot out a window of his truck because he had locked his keys inside, then drove north on I-15. The deputy went searching for the suspect's truck and soon spotted it near a town called Spanish Fork and initiated a stop, Cannon said. After waiting for backup to arrive, the driver, later identified as Gallemore-Jimenez, was ordered to show his hands by sticking them out the driver's side window. Dash-cam video the sheriff's office released this week shows Gallemore-Jimenez reaching back into the cab of his truck and emerging with a snub-nosed revolver, firing three shots. Cannon said four deputies and a Spanish Fork Police Department officer opened fire as Gallemore-Jimenez drove away. Despite the rear tires of his truck being blown out, Gallemore-Jimenez continued down the busy freeway at about 30 mph with officers pursuing him and blocking off exits so he wouldn't exit the freeway. Cannon said the low-speed chase went on for nine miles. At some point, a sheriff's office SWAT officer involved in the initial firefight sped past the suspect to block an off-ramp leading to a university, Cannon said. When the suspect swerved to exit there, the SWAT officer unleashed a barrage of shots from an AR-style automatic assault weapon. Cannon said all 27 shots hit the truck and caused the driver to crash. Officers swarmed the truck, arrested the wounded suspect and seized the revolver and a shotgun from the cab of the bullet-riddled truck, Cannon said. Officers also found methamphetamine and marijuana in the truck, Cannon added. But the drama didn't stop there. While being treated in the hospital, Gallemore-Jemenez confessed to shooting a man a day earlier in Colorado, Cannon said. "He was rambling, talking a thousand miles a minute. It seemed pretty clear that he was under the influence of something," Cannon said. "He told us he had sot someone in the back near Denver. We followed up on that." Investigators learned that Gallemore-Jemenez was suspected of shooting a man in Aurora, Colorado, during a dispute over the truck he was driving, which had been reported stolen. Cannon said he eventually tracked down the suspect's father and learned through a phone conversation that Gallemore-Jimenez was heading to a drug rehab facility in Las Vegas when the shootout occurred. "His father said he has had substance abuse problems for years," said Cannon, adding that Gallemore-Jimenez had a lengthy criminal history that included arrests in seven different states for crimes ranging from burglary to drug possession. Gallemore-Jimenez's attorney, Eric Jacobson, a public defender in Utah County, did not return calls from ABC News seeking comment. Ryan McBride, a deputy Utah County attorney, told ABC News that Gallemore-Jimenez was charged with three counts of attempted aggravated murder, failure to respond to an officer, possession of firearms, possession of drugs, auto theft and driving with a suspended license. Gallemore-Jemenez has since been released from a hospital and is being held on $1 million cash bail at the Salt Lake City Jail. The sheriff's deputies and police officer involved in the shooting were all initially placed on paid administrative leave while Utah County prosecutors investigated the episode, Cannon said. Three of the deputies have returned to work, Cannon said.